This is a delightful little book that really gets you thinking. I stress the ‘little’ part not as a negative, but as a good thing. There is nothing worse than fat, bloated popular science books where the author feels they have to get 120,000 words to be taken seriously. This is the sort of book that can be read in a couple of hours – but you will get so much more out of it than one of those tedious doorstops. The premise underlying the book is in once sense extremely simple, yet is fundamental to an understanding of what science is and what scientists do. And it is an understanding that is totally at odds with the typical way science is portrayed both in university lectures and popular science books. 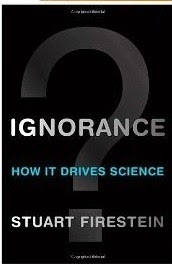 As Stuart Firestein points out, what is important is not the facts, but rather the area of ignorance. The interesting part and the fundamental heart of science is not about what we know, but about what we don’t know and where we want to look next. When I give my talk based on my book Before the Big Bang, I end by talking about dark matter and dark energy, and how our lack of any real idea of what these are means we know very little about the majority of what makes up the universe. And, I stress, this isn’t a bad thing – this is what makes science interesting. Stuart Firestein takes this viewpoint and puts it at the heart of science. If I have any moan, the introductory section is just a touch repetitive on the central role of ignorance in science, but I think it’s such an important aspect that so few people recognise that it’s well worth hammering home. I also, despite the case histories he gives, find it difficult to follow his explanation for the process of selecting the right bits of ignorance to work on. But overall this is a great book and recommended reading for both scientists and anyone with an interest in science.